Please bear with me while I learn. 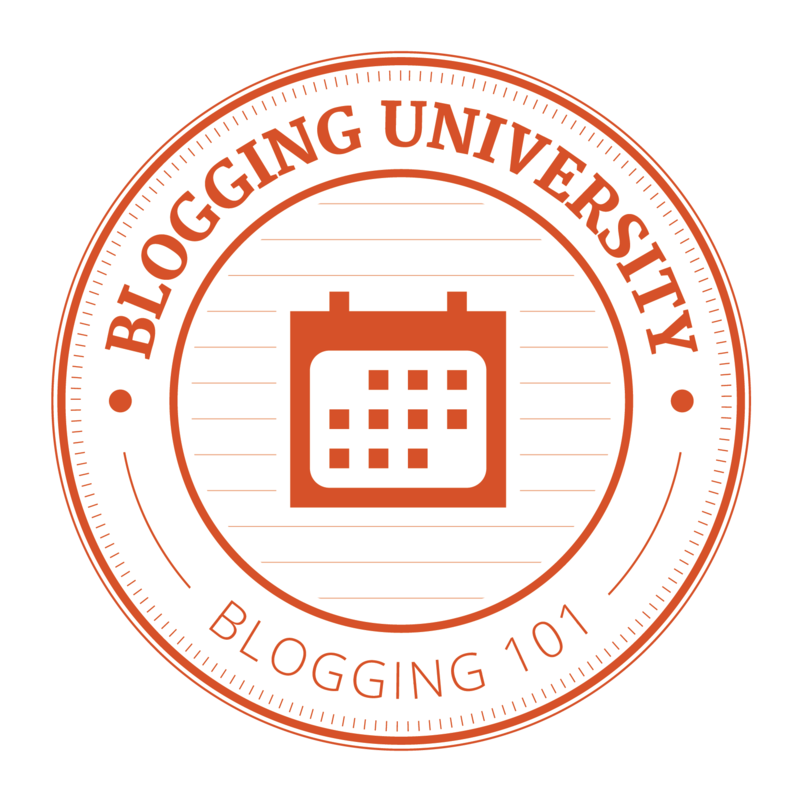 In an attempt to write more regularly as well as discover a few ins and outs about blogging that I am certain I am not familiar with, I have registered for Blogging 101 on Blogging U. For the next three weeks, I will be completing a daily assignment designed to help me develop and advance my blog (I can use some help). Although I introduced myself on my About page, I suppose I can elaborate a little bit here. Why do I write this blog? I have always needed to write. As a child and adolescent, I wrote poems and kept journals. I continued through adulthood until life took over…career, marriage, motherhood, etc. The funny thing was that life may have trampled all over my writing habit, but my need to write never extinguished. I always felt like I had to somehow find my way back…and then I stumbled upon blogging…and my kids said I should write a blog about them. I was in. I could be a mommy and still feed my hunger to put words to thoughts and feelings…to paint a picture with my words. This is what I try to do in this blog. I try to capture the essence of a parenting moment and recreate it in writing. As a bonus, readers comment on my posts. I absolutely love this interaction! It seems like a symbiotic relationship to me. Being a mom gives me material to feed my writing soul. I hope to continue to write more regularly, as I find the discipline to make time for this essential part of my day. I remember the day last spring when Ocean Breeze “un-unicorized” her locker. “Unicorns are for babies”, she said as she removed every magnet, clipping and photo of unicorns that she had so blissfully collected over the past few months. “I want to ‘unicorize’ my locker”, she had announced when she put up the first picture not that long ago. I stood there behind her with my hands out like a shelf, receiving all the precious memorabilia which she had apparently outgrown in a matter of months. My job was to take it all back home, where I presumed it would be safe from peer judgment and ridicule. I did as I was told, but I had a hard time accepting that she was so soon finished with unicorns. I hung the magnets and pictures on the metal posts of her loft bed. Other items I placed carefully on her desk, knowing she would come home that evening and want to look at and handle these mementos. And what did she replace them with? Well, beauty products of course! A mirror, hairbrush, a container with the word “dance” on it, etc. (no make-up allowed yet). These were things that I suppose were more in keeping with the ever-present desire to age that is so prevalent in adolescents. 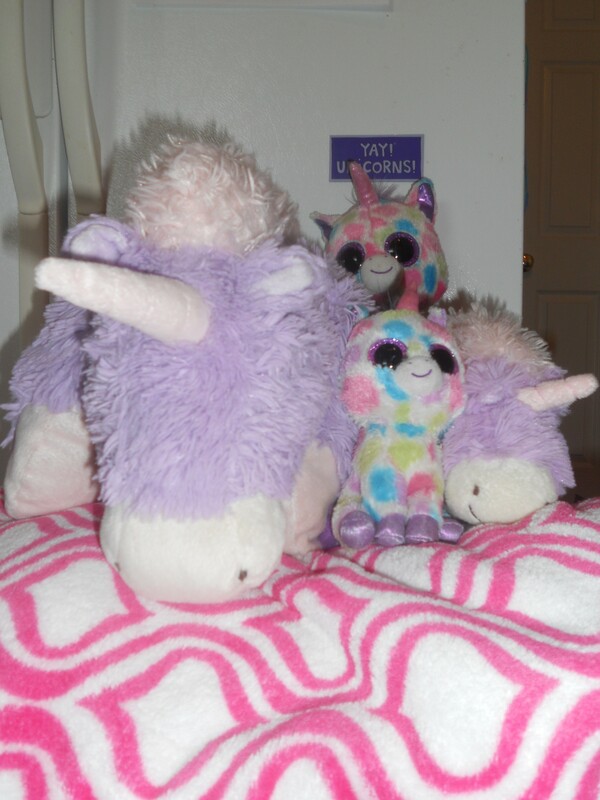 The unicorn magnets still cling to her bed posts like babies clinging to their mothers’ legs. They remind me that she hasn’t quite flown away from wonderland yet. She merely stepped out the front door for a minute and left it open so that she could come back in. So here I am writing about her. The truth is that she’s right. Although performing a jazz piece for the first time does not appear to carry the same weight that balancing on pointe for the first time does, it bears a magnitude of importance when looked at in relation to her world. “Get Your Sparkle on” was her jazz piece, and my girl was sassy yet precise. For the first time in her dancing years, she danced her choreography without the aid of a dance instructor off-stage marking the steps. For the first time, she had to really memorize her choreography. Did she accomplish it? And then some! Like I said – sassy yet precise. This means that although she was keenly aware of delivering a performance accurate in technique, her personality was not lost in concentration. My girl’s smile illuminated the stage. She followed us with her eyes…never losing us…capturing us with the fun in her heart. So what about her? Is “what about me” the plight of the little sister? Is she constantly feeling compared to her older sibling? Always feeling like she has to live up to a standard that was set years before she arrived there? Always following a path that was already forged for her? Constantly dancing in someone else’s shoes? I hope not. The truth is that she sparkled all on her own. Her performance so individual and so different from anything her sister had ever done. But what do we do to help her feel that internally? How do we say you shine all on your own? I’m not sure what the correct answer to that question is, but my mama gut tells me that I have to let her forge her own path on some things. I have to let her be the trail blazer on something. Everyone deserves the opportunity to feel like they were the original one for something…or maybe even the only one. Could it be soccer for Pony? This is a sport that she has shown interest in but one that we have not had the time to pursue. I, adamant in not over-scheduling my children, have refused to add yet another extracurricular activity to a week already filled with a night of piano and several nights of dance. But piano and dance are things that Ocean Breeze pioneered in our family. Pony followed suit, because she wanted to learn what her big sister had learned…and it was certainly easier for me to take them to the same location after school than to do the insane rounds of dropping off one kid, driving to pick up the other, and then going back for the first. Could it be her time? Do I need to bite the bullet and add soccer to that preciously free Thursday night? (and those relished activity-free weekends?) It’s not that she does not enjoy dance and piano. I don’t think she would give either of them up (well, the verdict is still out on piano). It’s that I think she needs her own niche…her own world. I think she needs a place where there is no one to be compared to, even if she is the one doing the comparing. I feel that she wants to be able to say, “This is Pony’s thing, and nobody else does it.” Would turning an already painfully hectic schedule up-side-down be worth the validation that she would feel in knowing that her interests matter and that she is more than a copy of her big sister? I might find myself testing the waters this fall. 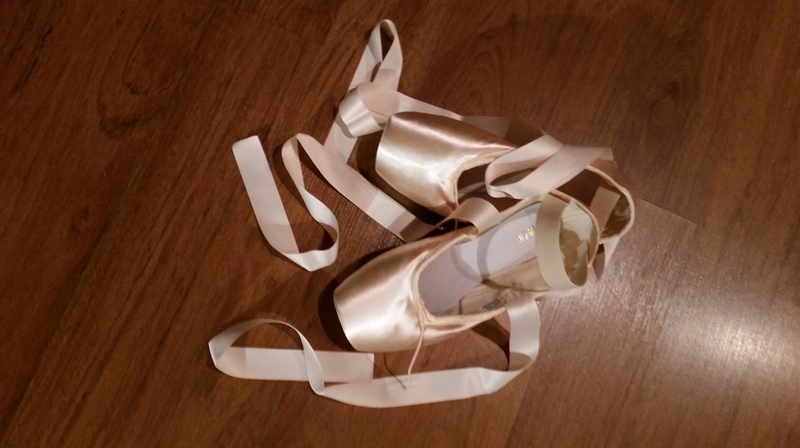 Did you catch the picture of the dainty and pristine pointe shoes featured at the head of this post? It is a shot of Ocean Breeze’s first pointe shoes taken minutes after I had spent no less than two hours lovingly sewing the ribbons and elastics onto that gorgeous and long-awaited set of footwear. 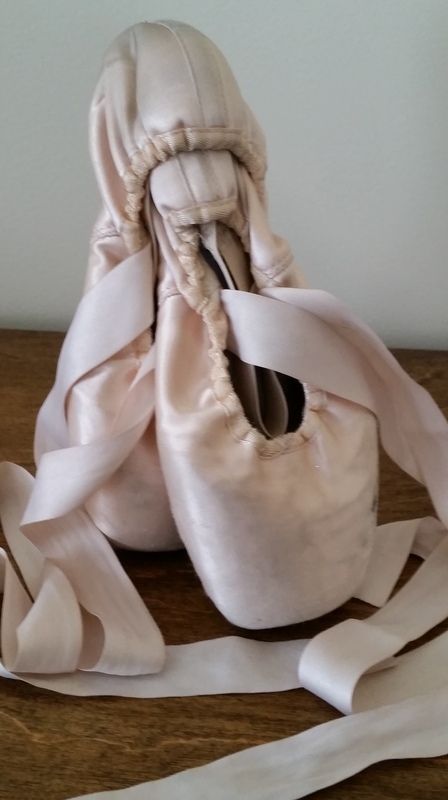 This is what they looked like before she ever wore them…before the work of learning to dance en pointe began. Truly, the work began three years ago when she took her first pre-pointe class. This year, she was finally strong enough to slip into those delicate-looking slippers…and I use the words “delicate-looking” deliberately. If you pick up a pair of pointe shoes, the first thing that will strike you is their rigidity in contrast to their soft and satiny exterior. A brand new pointe shoe does not give anywhere where you would expect – you almost expect it to be made of wood. In fact, it is made of a satin exterior and leather sole with the toe box made of multiple layers of fabric or cardboard hardened with glue. A dancer would wear toe pads for cushioning before slipping on the shoes. “Slipping on the shoes” entails inserting toe separators between the first two toes to keep bones properly aligned and avoid damage, then covering all the toes with a silicone or fabric toe pad before unrolling the foot of her transition tights over her feet to contain everything. She is now ready to step into the shoes and secure them by firmly tying the delicate ribbons around her ankles (not her calves). She is now ready to dance. I stood at the edge of the studio’s doorway this past fall when I watched my daughter go through this routine for the very first time. I watched with amazement laced with maternal pride as she tentatively rose to her first position en pointe, and I felt her engage every muscle in her body as she held herself high and strong. She did this week after week for eight months…there was rarely a night when her legs didn’t ache and her feet didn’t burn. Yet, she returned each week…growing steadier, training her body to flow like water on muscles hard as steel. Occasionally, I would peek in…maybe linger at drop-off just long enough to catch the intimate moment of her lacing her shoes. Even that requires precision, as the knot must end up at exactly the correct soft part of her ankle so as to not rub her uncomfortably throughout her lesson. As the months passed, technique work turned into choreography and choreography turned into dance. She made her pointe debut at this year’s dance recital just a few weeks ago, and although she was dancing in four different numbers, it was the pointe piece that grabbed hold of her nerves. She would be dancing in the ballet company alongside dancers who had been training en pointe for as long as nine years. Of course her strength would not be the same, of course her part would be at another level…but that was not what I was there to watch. As I sat in the center of the fifth row, cloaked under the darkness of our elegant and gorgeous theater, I watched my angel make her appearance. I took in her graceful figure and allowed my gaze to drift down to her feet. I swelled with pride as she echapped from a perfect fifth position and held en pointe. Beautiful. Classic. Love. This is what the weekly grind had refined. Pique turns accomplished. Impeccable port de bras. A beauty floating like vapor who is still the queen of the leaps. Her work this year was done, and even from the proximity of the fifth row you would not notice the labor in the shoes. You would not see how the shoes themselves carried the load of the dance, how they bore their own bruises, how like life itself, their luster seemed to be left with their youth. Their work this year was also done. professional photograph of the girl who brought them to life. …And ten weeks worth of adrenaline, anticipation and excitement exploded, as thousands of elementary school kids and their families erupted past the start line at this year’s GO FAR 5K race. Yes, I cried. 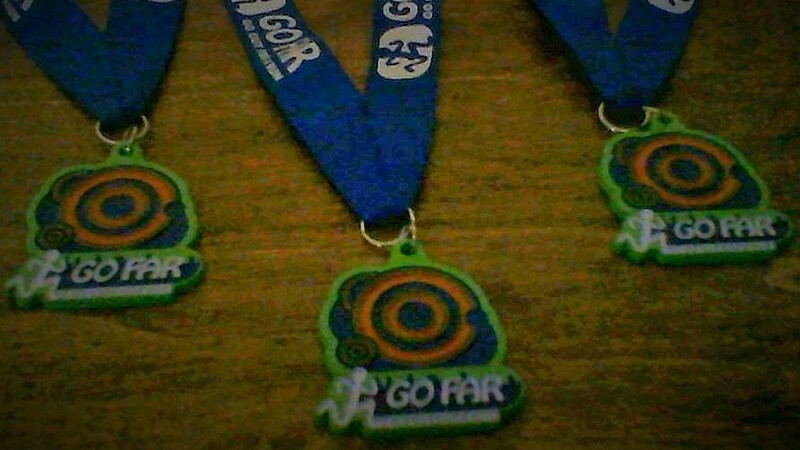 GO FAR (stands for Go Out for a Run) is a program that trains children to run a 5K road race a few minutes at a time. The ten-week program starts the kids out running for 2 minutes, walking for 4 minutes and repeating this cycle for a thirty to forty-five minute period. As the weeks progress, the amount of time spent running increases as the amount of time spent walking decreases. By the tenth week, the kids are running fourteen minutes and walking just one minute! In addition to the physical training, there is also a character-building component to the program. Each week the coaches give a small lesson focusing on different topics, such as sportsmanship, safety, setting goals, etc. Towards the end of the program, the topics might include learning the appropriate way to drink water from a water station at a race and the polite way to pass other runners. One of the advantages of this program is that families are encouraged to train with the kids and run the race with them. This is the third GO FAR race that I have run with at least one of my kids. This year I managed to train with each of my girls – one day a week at each of their schools and alternating the third day between the two schools…in the interest of fairness 🙂 Yes, it was an exhausting ten weeks, but yes, it was worth every bead of sweat, every aching foot, every insane morning remembering to pack running clothes, snacks and water bottles…for the right kid and for me too. In GO FAR, it is ALWAYS worth it at the finish line. The cool thing about being able to participate in this club is that I get to see these kids grow and evolve. They start out huffing and puffing after two minutes of running, and I see them grow stronger as their lungs and their hearts gradually learn to hold on longer and longer. I see these kids set goals for themselves, and I feel their pride when they reach these goals as the weeks go by. I see them encourage their friends when they are not feeling so strong, and I see them pick out buddies to run with because they think they might challenge or encourage them. Of course, by far, the most rewarding moment is to see them all on race day…dressed for the part and with so much momentum that I think they will set fire to the track! We take group pictures, we take friends pictures, we take selfies, we line up for the race ever so proud of the colors and the schools that we represent. Have you ever wished that you could be two mommies at once? Split yourself in two and be with two different children at the same time? Of course you have, if you are the parent of more than one child. This is exactly how I felt as we lined up, wave by wave, with 2400 other runners minutes before we were to begin the race. About half-way through our training schedule, I had to make the difficult decision of which of my babies I was going to run the race with, which school would I represent. Because I had already run two races with my older daughter Ocean Breeze, and because last year our little Sea Pony did not get to run with her own school but rather as a little sibling in her big sister’s club, I decided to run the race with my little Pony and register under her school’s team. Since Ocean Breeze had some experience running a 5K and this year’s course was very similar to last year’s, I felt she would be safe running the race with one of her friends. Breeze’s school lined up in Wave Two, while Pony’s school lined up in Wave Three. Although we were right behind them and I could see some runners wearing the colors of her school, I could not see my own Ocean Breeze from where I stood. I longed to make eye contact with her, to wish her good luck and blow her a kiss. The honker sounded for Wave Two to begin, and I was overcome with emotion. I cried. At first, I did not understand my own tears. As I turned my face down trying to hide what I considered to be a silly display, I searched for a reason…for a label to pin to my confusion. Then I understood. This was the first time that I was not running with her…side by side…stride by stride…breath by breath. My girl would run her first race on her own, and although I had been prepared to let her grow this way, letting go of that tiny little part of her childhood wrapped itself around my heart and squeezed just enough. The honker sounded for Wave Three, and Sea Pony took off…well…like a racehorse! For a few minutes I worried that I would not be able to keep up with her explosive pace and that I would lose her among all the runners…but then I remembered her track record. Explosive, swift and agile she is, but she is only able to sustain her powerful speed for minutes at a time…she is, after all, very young. Before long, I spotted her and we were walking together hand in hand. She made her way through the first mile with a series of sprints followed by restful walks. Whatever she did, I was with her. By the time we began our second mile, my Pony was ready to call it a day. “I don’t like this race”, she protested, “I want to go home.” My work became to encourage a reluctant participant through two miles of ups and downs and in-betweens. “Well, we’re almost half-way”, I replied, “Maybe if we can make it to the water station, we will feel better.” And so it went for two miles…one landmark at a time. At our hardest point, one of her little friends appeared and held her hand. She offered conversation that would take her mind off the race as well as living proof that it was acceptable to walk the last two miles of a three-mile race. As we rounded our last turn and with the finish line in sight, I challenged them to run for the glory, to give it all they had, to finish strong…and they did. I ran behind them…supporting them, encouraging them, carrying them…and I watched my daughter’s beautiful body sail swiftly across the finish line, as her big sister cheered us in. She did it! They did it! My Ocean Breeze had finished about twenty minutes ahead of us. She truly ran her race. She had picked a running buddy with abilities similar to hers, and together they came up with a program that had running and walking intervals that were doable for them…what a big girl. I was so proud. I was proud of all of them, as with every GO FAR race that I have run. On Monday, they all wore their race t-shirts and their medals to school. They wore them with well-earned pride because, indeed, in ten weeks these kids had gone far. If you ever get the chance to run GO FAR, go for it! There is no Major League Baseball team in the town where I live…but that’s OK. We have a minor league team that feeds into the major league team from the city where I grew up. This means that for $11.00, I can get a seat behind home plate that in my hometown would demand close to a three digit figure…not too shabby. That’s where I was with the Sea Critters last weekend…enjoying one of my favorite summer pastimes. Maybe it’s because to me it signals an early start to summer. Maybe it’s because I can sit outside for three hours with a hot dog and a cold drink and forget whatever ails me outside of the stadium lights. I love baseball. To follow the game means to lose myself in the focus of it, to be absorbed by the mathematics of it and yet to be entertained by the ridiculousness of the jingles – the little songs that both personify and introduce each player at bat. The fun, I think, is in guessing how the song applies to the player. Baseball is slow and warm and open-air. It is the antithesis of my day-to-day life…an oasis. And how did the Breeze and the Pony handle three hours in one place without WiFi or Barbies? Fabulously! Dinner was a priority, of course. After that, their energies were turned towards the long promised cotton candy. Of course the cotton candy man will come down to our seats, I reassured them…once…twice…again…and again…until even I started to wonder if we had somehow managed to sit in a “sugar-free” zone! I understood that there would be no peace, no lazy-hazy ball game until this promise was fulfilled. There was nothing else to be done but to get up in the middle of the inning and hunt down this cloud of joy. …and then all was well…the crack of the bats…the cheers…the runs…and the runs…and the home run! And the chatter of my girls as their sugar levels rose and they could no longer sit still. Still the game played on, as I counted down the innings for my little Pony and watched her do subtraction in her little head. All energy lifted to a fantastic crescendo of the winning out, crowned by a spectacular fireworks show. What a night! As we made our way home, hours past our bedtime, I hoped that the thirty minute drive would be enough to exhaust the sweet energy that the Sea Babies had consumed…I had one down as we docked. Still I coaxed them to brush their teeth before making their final landing for the night…or else the sugar bugs would have had a sugar high that night!